This Week's Nintendo Download is So...Awww, Kitty! Another week, another handful of games you may or may not give a damn about coming to Nintendo's download ready devices, including Xmas Puzzle, a WiiWare game about...oh my god it's so fluffy! Awww, look at him, all curled up in the holly. Are you dreaming of sugarplums, my little tiger-striped friend? I just want to tickle your little tail with my Wii remote pointer, you're so darn cute. Who's a good kitty? Who is? That's right, you are, Mr. Fluffykins! That's his name now. Mr. Fluffykins. 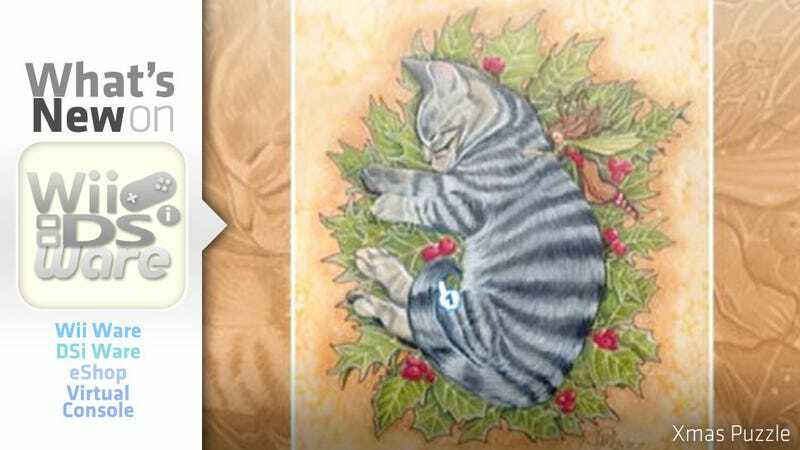 For our readers that are not into kittens, note that those berries are likely poisonous, and holly leaves have sharp edges, so not only is this kitten likely dead, it's being posthumously stabbed with Christmas cheer. And for the rest of you, awwwww. Don't you just want to hug every cat? Enjoy the Christmas with your family using fantastic puzzles! Xmas Puzzle is a game in which you must solve the different, progressively more difficult puzzles as you advance in the plot. • Enjoy with 4 friends or family members playing at once. • Puzzles progressively more difficult. • Helps develop sensory skills. Double Bloob is a cartoonish, arcade-style vertical shooter. The planet needs you! Bloobs have invaded the Earth and took a little dolphin named Will as a hostage! Don't let the Bloobs win! We all love arcade games. Double Bloob is one of those you immediately fall in love with. The simple story of two siblings – Aen and Niua – who, with some help of Doctor Maybe's inventions, try to set the little dolphin free is a just an excuse to have a great fun while shooting hordes of Bloobs that fly out in the sky. The colorful 2D graphics enhances the gameplay and draws the player more into the story and the game world. In order to keep the player entertained, the game contains tons of weapons and power-ups. Complete 8 different worlds and 48 levels to save Will from the evil Bloobs. Are ready for the confrontation? Who is going to be the winner? You or the Bloobs? Prepare yourself for loads of fun and invite your friends to beat your high scores! • Join Dr. House and his elite diagnostic team. • Race against the clock to solve a new medical mystery. Master Higgins goes on a great adventure, armed with his skateboard and stone axe. Master Higgins sets out on a quest through Adventure Island, a group of uncharted isles filled with caves, deserts, volcanoes and glaciers. His princess has been kidnapped, and he is the only one who can save her. To aid in his search, Master Higgins will need to equip his skateboard and use a variety of weapons as he fights his way through eight different worlds. Grab food along the way for a recharge and avoid an untimely death. Find hidden eggs for fast shortcuts and bonus items. Enlist the aid of dinosaurs as you take to the skies, or shoot fireballs at unsuspecting foes. The search for the princess will be the adventure of a lifetime.